4/17 Cup of Coffee: It was a great day for pitchers throughout the Red Sox organization. 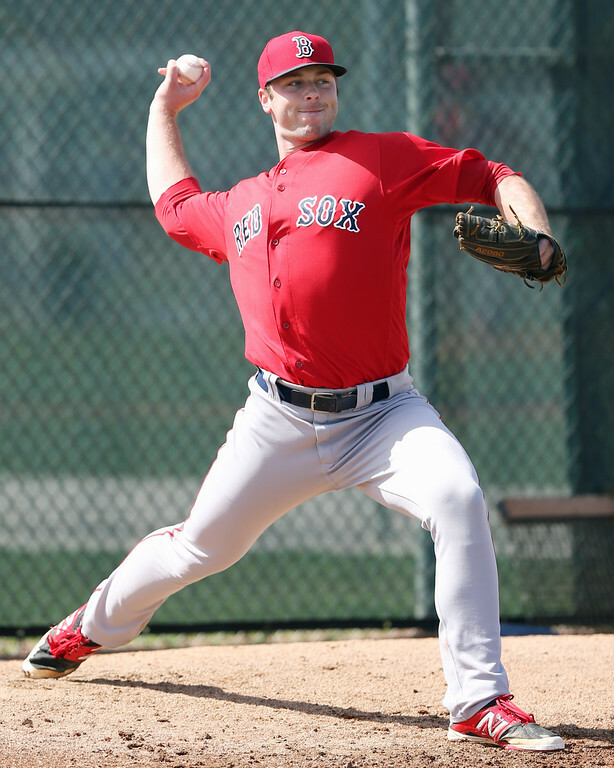 Brian Johnson, Ty Buttrey, and Ben Taylor (pictured) all turned in solid starts for their respective teams. At the plate, Andrew Benintendi and catcher Sandy Leon put up big nights in a good all-around day for Red Sox affiliates. Brian Johnson, fresh off a solid season debut, took the ball for the PawSox and turned in another sharp performance. Through 5 1/3 innings pitched, he allowed two earned runs on five hits while racking up five strikeouts and two walks. The bullpen combined to pitch scoreless baseball after Johnson's exit, with Roman Mendez tossing 1 2/3 shutout innings and Pat Light and Heath Hembree each throwing a scoreless frame. Catcher Sandy Leon was the offensive star for the PawSox on Saturday afternoon, kicking off Pawtucket's scoring with a two-run homer in the second inning. Leon, who reached base three times in the game, also scored on an RBI double by Cole Sturgeon in the fourth inning. Chris Dominguez also turned in a big game, going 2 for 4 and driving in a run with a double in the third. It was a quiet day for the Sea Dogs lineup as the team was only able to score a pair of runs against Hartford on Saturday afternoon. Portland scored both runs in the sixth inning, starting the inning by loading the bases on singles by Tim Roberson and Ali Solis and a walk from Jordan Weems. The Sea Dogs then scratched out two runs on a pair of groundouts by Tzu-Wei Lin and Jose Vinicio. Ty Buttrey started on the mound for the Sea Dogs looking to improve upon his first start of the season. The big right-hander took his second loss of the season, as he allowed three earned runs on four hits while punching out five across 5 1/3 innings. He then turned the ball over to Portland's bullpen, where Williams Jerez tossed 2 2/3 innings of one-run ball and then Rob Wort allowed a pair of runs in the ninth inning. It took ten innings to get the win in Winston-Salem but the Salem Red Sox eventually got the job done on the strength of their pitching. Ben Taylor started and threw five excellent innings, striking out five batters and allowing no runs on just three hits and a walk. He turned the ball over to Jamie Callahan, who allowed a pair of runs in his two innings of work before giving way to Adam Lau who earned the win with three scoreless innings. Offensively, the Red Sox were fairly quiet, picking up just three runs in ten innings of work. A handful of notable Red Sox prospects contributed to a two-run third inning, where Andrew Benintendi doubled in Mauricio Dubon and then scored on an RBI single from Nick Longhi. Salem then did not score again until the top of the tenth, where Dubon came through with an RBI single to score Yoan Moncada to win the game for Salem. The Drive were the last Red Sox affiliate to play on Saturday and took home the win thanks to a good day from the Greenville lineup. Michael Chavis drew first blood with a two-run single in the first inning. The Drive then scored individual runs in the fourth, sixth, and ninth innings on solo homers from Roldani Baldwin, Kyri Washington, and Trent Kemp. On the mound, the Drive received a mediocre performance from Daniel Gonzalez, who only allowed two runs but struggled with his control, walking four in four innings. However, Kuehl McEachern was dominant in relief, collecting four strikeouts in three perfect innings of relief. Bobby Poyner allowed just one unearned run in his two innings as the Drive won the ballgame. Player of the Night: It was a day of dominant pitching throughout the Red Sox organization on Saturday and Ben Taylor was the best of the bunch. Drafted as a relief pitcher out of South Alabama in the seventh round of last year's draft the Red Sox have slotted Taylor into the rotation to begin his professional career and the results have been good so far. He went five shutout innings on Saturday night, striking out five to lower his ERA to 1.00 on the young season.